We are able to furnish you all of your equestrian and agriculture needs, with our broad range of essential items here at Farm & Country Supplies. Among our exhaustive range of products, we have everything you need to build effective electric fencing. There should be no contact between electric fence wire, tape or rope and the ground. Unless plastic fence posts are used, which aren't conductive then insulators are necessary. Not only are we able to provide excellent quality electric fence insulators and wire, we also have a wide selection of electric fence insulators available. You will find everything from super heavy duty insulators to pigtail insulators, as well as bobbins, strains and accessories. We have just the right type of insulators from our online store, each suited to your needs perfectly. We are on hand to discuss your particular fence requirements and help you chose the right insulator for the job. You will usually need one insulator for every point the wire or rope passes a post. With an insulator to anchor either end of the fence wire, this will normally be a corner insulator. To get the best out of your electric fence, it is best to have the right number of insulators for each fence post. Available in multipacks for your convenience, our selection of quality electric fence insulators come in nail or 'screw in' varieties for security. We also have free hanging pigtail electric fence insulators for rope and wire. 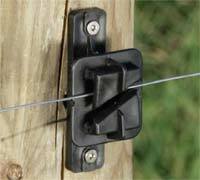 Whether you're using wire, rope or electrotape, you will find the ideal electric fence insulators at Farm & Country Supplies. If you need assistance setting up your electric fence, please do contact us and we will be happy to provide all the help we can. If we don't have the advice right away, we have a network of experts and suppliers we can contact on your behalf. Please call 0800 056 002, or e-mail enquiries@farmandcountrysupplies.co.uk for further information.